It’s winter time where I live. The winter is extremely cold, so we can’t get out much with kids. This keeps mom busy all the time. So, I’ve come up with this easy and very cheap entertainment idea. Color modeling dough for kids.Here are few busy mom tips I’d like to share. I take flour and starch in equal amount. Add few table spoons of salt. The base is ready. 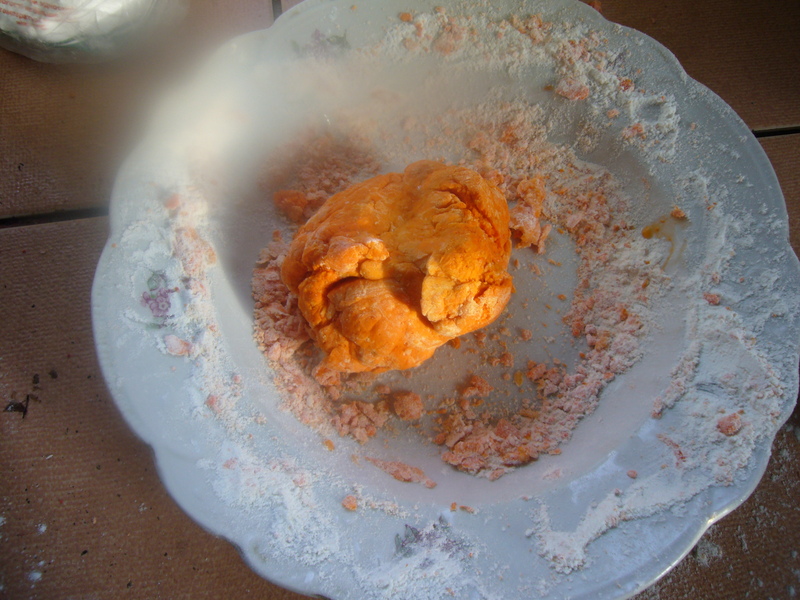 Then I dissolve food colouring agent in water and mix it into the dough base. You can make it any color, you can find. The time it takes to make such dough is only about 5 min, as for most of my recipes. But, it keeps your kids occupied for at least half an hour. And, it is cheap. Here, where I live one jar of modeling clay costs $1,5 and you need couple of them just for one time play. This dough costs you few cents. And, you can put the models into your oven to bake them. They become very hard and can be kept on your shelves for good. This entry was posted in Uncategorized and tagged color modeling dough recipe, creative tips, modeling dough, modeling dough recipe, modeling with kids, tips for moms. Bookmark the permalink.